Whether you want to save money or just want bragging rights for being able to change your brakes yourself, it is a lot easier to replace brake pads and rotors than most people think. 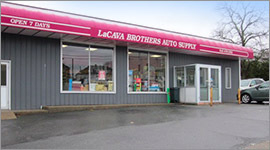 LaCava Auto Supply in Fall River has all of the car parts, tools, supplies, and services that you need to do a brake job at home. DIY car repairs are a great way to save money and ensure that your car is safe and properly maintained year-round. In addition to selling new rotors and other brake-changing supplies, we also offer rotor turning services, which can help you to save a little bit more on a complete brake job. Ask one of our team members about rotor turning services to find out if your rotors are eligible for this type of service. Before you get started, make sure that you have the right tools for the job. Our auto supply in Fall River carries a wide range of tools and equipment that you can use to make the job go smoothly. The good news is that you most likely already have some of these tools at home in your toolbox, further reducing the amount of money that you will need to invest initially to start doing brake jobs for yourself at home. Stop by our Fall River, MA car parts and supply store to take a look at the options available for home maintenance work. Check the owner’s manual for your vehicle or speak with one of our team members at LaCava Auto Supply to find out what parts you will need to complete your DIY brake job. We can help you make sure you get the right size and type of brake pads, rotors, or provided quality rotor turning services, depending on your needs. Take time to go through the owner’s manual to find out what you will need to do or go online to watch repair videos for the exact make, model, and year of your vehicle for best results. If you have a friend that does their own mechanical work, you could ask them to come over and guide you through the process the first time. This can help you build confidence in your abilities and prevent costly mistakes. When it comes to brake services, the brake pad and rotor parts are usually relatively inexpensive. The cost for these services typically comes from the labor to get the job done. By doing the work yourself, you could save hundreds of dollars each time it needs to be replaced. Believe it or not, a brake job is one of the easiest types of mechanical work that you can learn how to do for yourself. Just make sure you follow all the steps and take the time to do it right since your brakes are an essential safety element for your vehicle. Stop by LaCava Auto Supply in Fall River to see our full line of car parts, tools, and accessories or give us a call at 508-676-1951 to get more information about the products and services we provide.